We are a leading Manufacturer of steel bar cutting machine from New Delhi, India. The high-speed Steel Bar Cutting Machine is manufactured for the purpose of overcoming productivity limitations in the cutting process. That is, it is utilized for cutting and pruning of steel Bars. 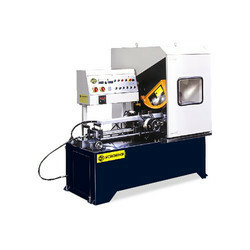 High performance and precision are the salient features which make this machine highly demanded in the global market. Last but not the least, we provide easy accessibility and that too at the most economical prices. Looking for Steel Bar Cutting Machine ?